Trigger Pull: The trigger pull is very light with an easy break. Accuracy: Very good, even with all the heavy blowback recoil! Build Quality: Excellent, with a good amount of metal construction, good weight and craftsmanship with good fit and finish. Much of the gun is made out of metal with the exception of some of the outer receiver and grips. Realism: Looks and feels like a real gun. It's hard to find any real differences other than the fact that it shoots 4.5mm BBs and has a bit more plastic than similar full-metal pistols. Comments: This is a really nice blowback BB gun. Although it is advertised on many websites as being all metal, it does have some plastic outer parts, but the parts that get the most wear and tear are made out of metal. That aside, the KWC Mini UZI is pretty much an exact copy of the real Mini UZI with many of the same markings as the original. One feature that makes it feel even more genuine is the very heavy blow back recoil, it is alarming at first and I would even say it has more recoil than a rim fire .22 caliber gun does! This replica is fun,but NOT all steel. It is ZINC or ZAMAK alloy. Only the screws ,pins springs and top cover are steel. The receiver is plastic. The bolt is alloy and so is the folding stock,that is easily broken. The main spring on the bolt feels like a toy,made for children to operate. The barrel. Thread cover detent plunger is not held in place,and easily lost. It should be pinned. It is also alloy,easily stripped. I do not recommend spending money on this,as it is built so cheap. The company advertises it as all metal, it is NOT. Not up to a good game of old fashioned army in the old days. I am very upset I got ripped off by Umarex. There has been some confusion when it comes to the KWC made Mini UZI regarding semi and full auto abilities and also when it comes to build materials. 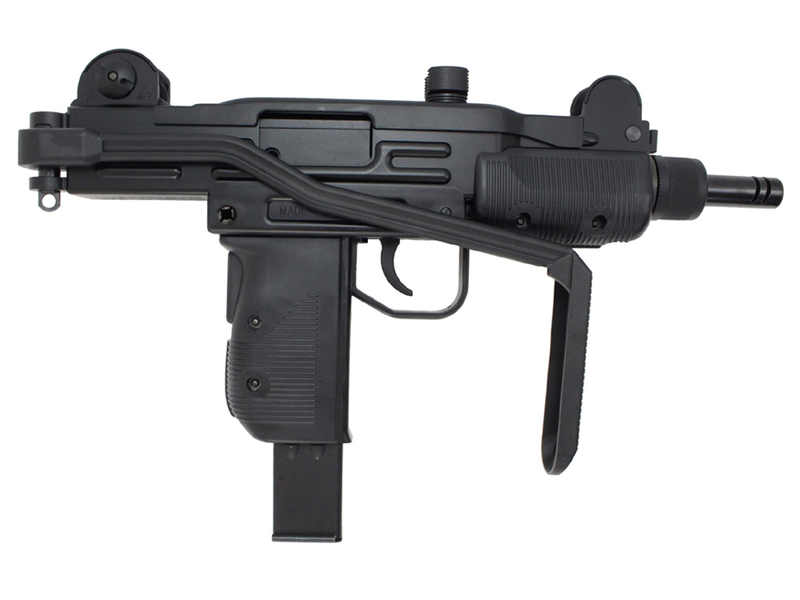 But before we get into that if you have one of these Mini UZI Blowback BB or Airsoft guns then most likely yours is made by KWC even if it was distributed through RWS, Umarex, Gletcher, Cybergun or some other company. When it comes to the build materials used they are all made by KWC so they are all built the same with plastic and metal in the same places. Let’s first talk about why some of these Mini UZI’s only come in semi auto with the Full auto selection not available out of the box. This is most likely because in some countries a full auto BB and/or Airsoft gun can be illegal so to play it safe many airguns that are originally made to shoot in both semi and full auto are modified to only shoot full auto. This is the case with most of the companies that redistribute the KWC Mini UZI under their own brand name. 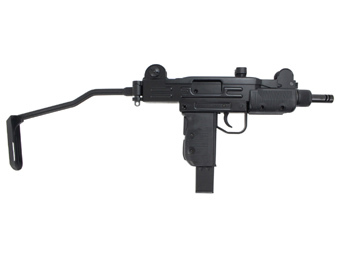 That said if you buy the KWC Mini UZI in either 4.5.mm Steel BB or 6mm Plastic Airsoft from our Replica Airguns Canada or US Online Stores, you will be getting a full auto ready out of the box airgun! 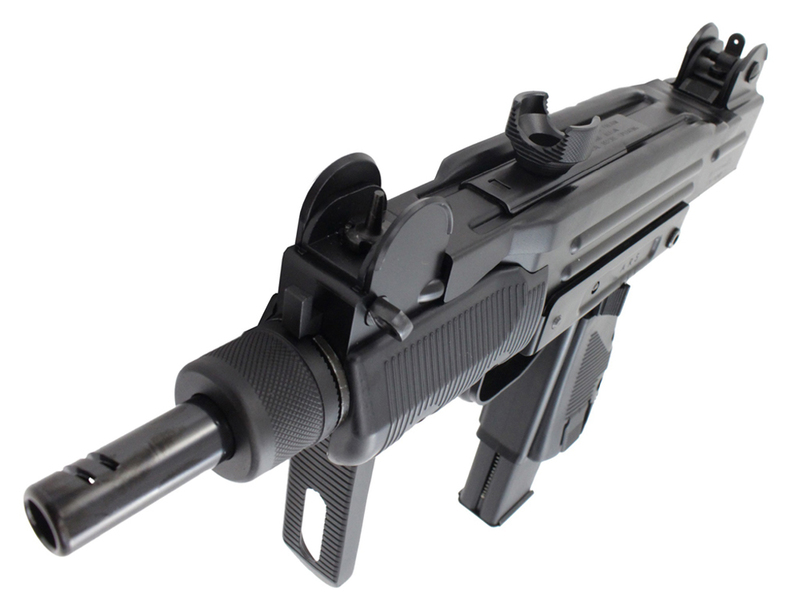 http://www.ReplicaAirguns.com - KWC - Cybergun Mini UZI BB Versus Airsoft Comparison Tabel Top Review. In terms of build quality they are made almost exactly the same and weigh in at a hefty near 5 pounds, the only differences is the inner barrel and magazines to accommodate the different sized ammo. 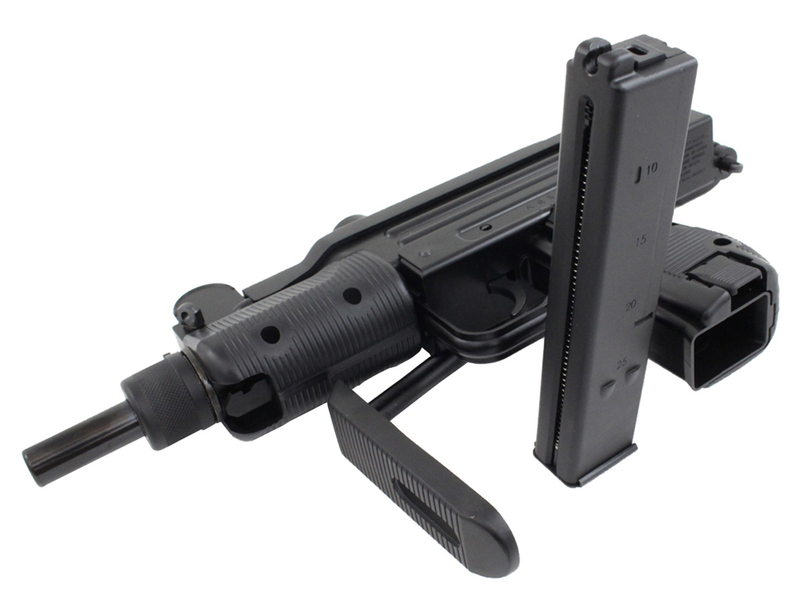 The BB version has a 25 round single stack magazine that does not have a follower to stop the bolt from continuing to operate even after the magazine is empty while the 6mm Airsoft version has a double stack magazine that holds 38 rounds and does have a follower to stop the bolt which can save you some wasted CO2. 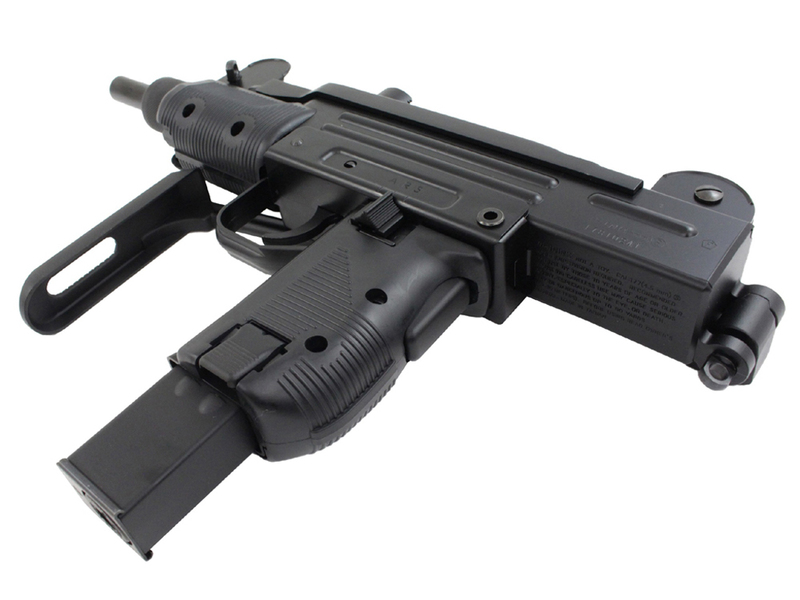 The Airsoft version Mini UZI is distributed by KWC while the 4.5mm BB version is distributed by Cybergun, you will find the UZI and IWI licensing on the Cybergun 4.5mm BB version but not on the KWC 6mm Airsoft version. 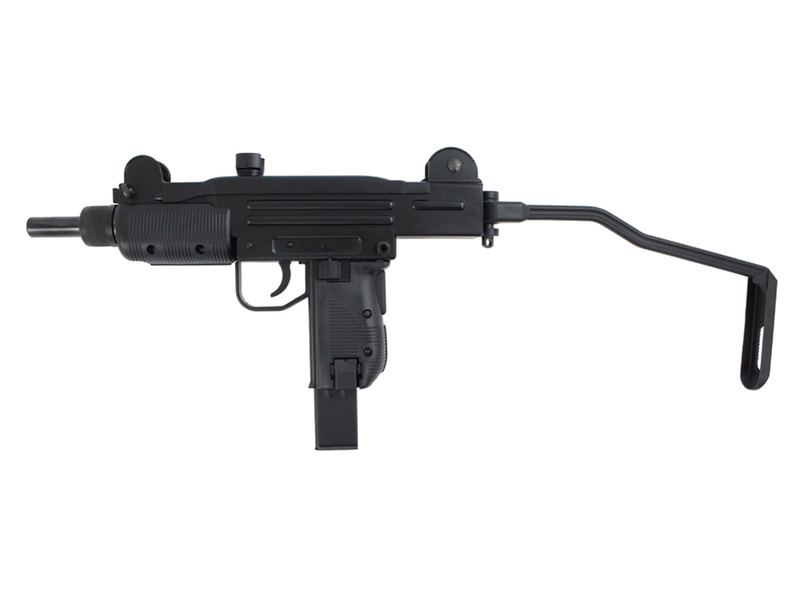 Out of the box the KWC Airsoft Mini UZI is ready to go in both semi auto and full auto while the 4.5mm steel BB version will only shoot in semi auto mode, it can however be easily modded to shoot in full auto as well. 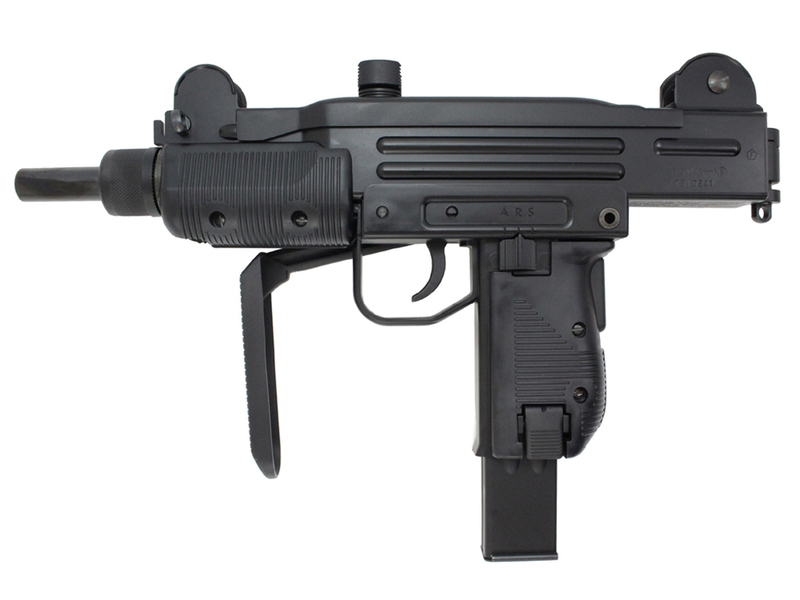 http://www.ReplicaAirguns.com - KWC Cybergun Mini UZI 4.5mm Steel BB Modified Full Auto Fun. This video focuses on my KWC/Cybergun 4.5mm Steel BB CO2 Blowback Mini UZI BB Gun, where I kick of a short series based around shooting a bunch of 4.5mm Steel BB machine guns! Sounds like fun cause it is fun! This KWC/Cybergun Blowback Mini UZI comes in a variety of versions, 4.5mm Steel BB and Airsoft versions, it also comes in RWS and KWC Distributed models. In this video I basically shoot a bunch of clay pigeons positioned in various locations and film it using 4 different camera angles to spice things up a bit. I also mention some upcoming videos where I will be shooting my RAP4 MP5 and Baikal Drozd Blackbird Full Auto BB guns so make sure to watch those video when I upload later on this week!